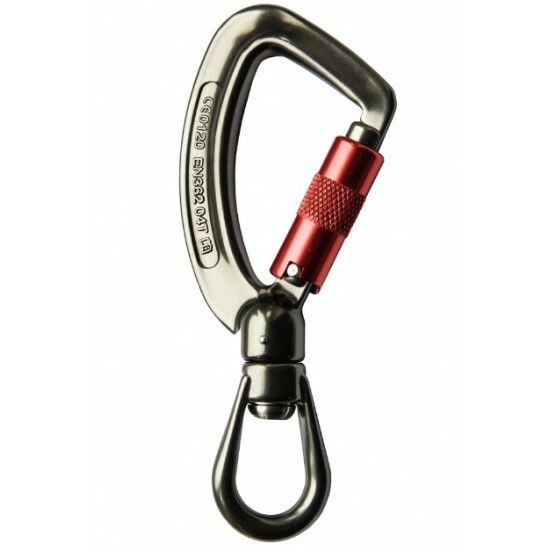 The ISC KH255 Twister karabiner has a captive eye and built in swivel. Rated breaking strength of 27 Kn and is ideally shaped to use with a flip line or side lanyards. The smooth ball bearing swivel system eliminates the need for a second separate swivel in the climbing system. The acute angle of the basket helps any captivated rope or sling gravitate towards the strong spine of the karabiner. The drop forged body is manufactured from high quality aluminium. An anodised coating is added to the smooth rumbled body before each karabiner is finished with an individual identification number all ISC karabiners are proof checked before dispatch. The ISC innovative blind nose design helps minimise the risk of any snagging or plucking damage to your climbing line. The patented ISC triple lock gates utilise stainless steel springs to ensure a long life under extreme conditions and are almost impossible to open accidentally, yet once mastered they can easily installed with just one hand. Square corners surrounding the locking pin area deploy build-up debris. As part of your climbing system any karabiners should be visually and manually inspected before use and after any significant incident e.g. a fall, to ensure they work as intended. Any maintenance including cleaning should follow the manufacturer’s guidelines. If you are in any way concerned about the condition or action of the karabiner you should retire it from use immediately.